As you probably know, tattoo power supplies are indispensable part of the tattoo machine for any tattoo artist, beginners and professionals alike. In the most simple sense, all the tattoo power supply do is one thing: control the electricity flow to your tattoo machine. In order to output the electricity usage, some of them have a mechanical pointer to show the voltage level while others have a more modern digital displays. If you looking for your first tattoo machine power supply for your tattoo gun kit, than you should know the every power supplies works pretty much in the same way. All the difference lies in the physical features like dual output, varying/multiple or fixed voltage level, and efficiency at handling fluctuations. So, let’s start with a warning: Do not use a tattoo machines setup with brand new power supply directly on client. Test. Test. Test all your equipment and be comfortable with it. Huge variety of voltage range is available for your next tattoo machine. Power supplies usually have voltage levels in multiple of 3, but some do come with as low as 1 volts. You can get odd voltage levels these days, if you need, but still the majority of electrical equipment including your collection of tattoo machines take voltage which is multiple of 3. Bigger the better? NO. Neither the reverse is true. Smaller portable power supplies work as good as large ones. For same specs, portable ones cost a little higher than the larger ones. The suggestion is not to spend until necessary. If you never go out of studio as a tattoo artist and you aren’t planning to do so anytime soon than you might not need portable and ultra-small tattoo machine supply. When working on a tattoo design, too get the desired outlines and fillers you will need to vary the pressure throughout the tattoo session. This is exactly the point where you will need a good tattoo gun power supply with lower electric current fluctuations. If you will pick a generic (unregulated) power supply, the power supplied will fluctuate as the needles pierce the skin. The regulated power supply compensates these fluctuations. This is where the price plays the role, higher priced power supplies will have the lowest fluctuations and vice versa. Do you need a new tattoo power supply? Depends on how you’re doing and where you want to head. If you travel frequently as a guest tattoo artist, portability is what you should be looking for. Get more portable power supplies if you do a quarter of your tattoo work outside the studio. If you have a fixed studio with enough space than equally efficient, larger system will be cheaper. You don’t need to buy an expensive portable power supply because everyone else is doing so. In case you aren’t enjoying the experience with the existing tattoo machine power supply, from fluctuations perspective or other reliability concerns, machines than you need a new one as well. Don’t play you your tattoo work future. In case you looking for a full tattoo set, we recommend the Grinder tattooing kit. It’s a hight affordable, with a great quality, tattoo set suitable for beginners and advanced tattoo professionals a like. Here is our full review of the Grinder tattoo kit. This tattoo set was put with the professional tattoo artist in mind. 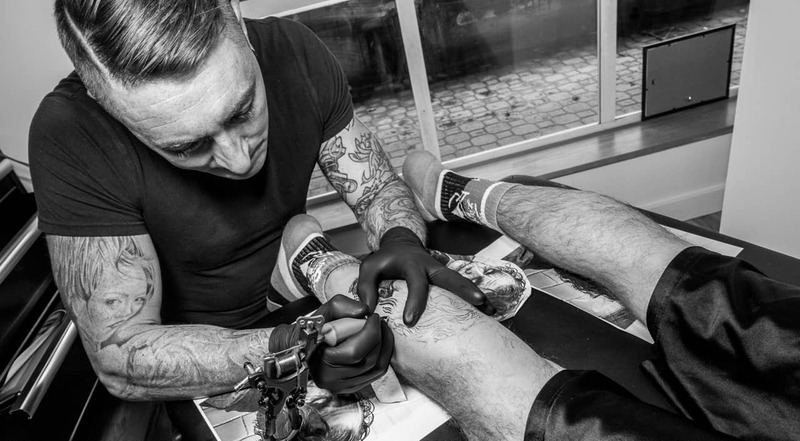 The tattoo machines are easy to work with, easy to tune and run as good as some of the best out there. The power supply is reliable and rugged. Unlike other tattoo kits available on the market, the Grinder tattoo kits include USA Made Tattoo Brand Ink by Radiant Colors. Don’t be fooled by cheaper tattoo kits which include Chinese Made tattoo ink which is unsafe to use! Radiant Colors has dedicated itself to create a sterilized, easy to apply, pure, uncut homogenized pigment. This tattoo ink are a homogenic fluid mix that creates s a solid, long lasting, bright color. With this kit you receive 4 tattoo machine suns, 10 coil, 7 bottles of Radians (USA) tattoo colors ink, all the needed tattoo accessories such as carrying case, high quality tattoo power supply, tattoo needles, tattoo ink cups, tattoo machine grips, tattooing gloves and a FREE 240 page Tattoo Instructional Book & DVD COMBO. A great kit all around with a high quality power supply for tattooing. If you need a single tattoo machine power supply for liner and shader we recommend the dual digital tattoo kit power supply by TattooStar. It’s a best-selling power supply on Amazon, with it you can connect both your liner and shader to the power supply and with a simple flip of a switch, you determine which one powers on. The fully digital design allows you to set the precise voltage. It comes with an upgraded flat foot pedal crafted in stainless steel which is a major upgrade from the basic square ones offered other models. The technicals are: Input: AC 60v-250v 50Hz-60Hz, output: DC 1.5-18v. Upgraded Stainless steel flat foot pedal, 6 foot clip cord. Digitally controlled output on this machine is from 1.5 to 18v with powerful yet stable current to operate ANY tattoo machine on the market. This tattoo gun power supple is very flexible and can be used in any country with any voltage from 110-220v.